Tasmanian Treasurer Peter Gutwein calls for the return of high-vis workers, with host of the TCCI’s statewide budget functions, CEO Michael Bailey. TREASURER Peter Gutwein is calling for Tasmanian tradespeople to come home, announcing millions for business, jobs and population growth initiatives as a part of his 2015 state budget. To view the June 2015 TBR online, click on the image. “If you wear a high-vis vest and are currently working interstate or overseas hear this message – there is work for you in Tasmania, and we want you back,” Mr Gutwein said, during his budget speech on Thursday, May 28. “If the message in the federal budget was to ‘have a go’, the message in this budget is to have that go here in Tasmania,” Mr Gutwein said. With the state’s population forecast to increase by just 0.6 per cent in 2015-16, the state government is poised to finalise its population strategy, which is designed to lift the state’s ongoing below-trend population growth significantly to achieve 650,000 people by 2050. In the meantime, the government is hoping that increased business confidence and investment in Tasmania’s North and North West will draw back some of Tasmania’s ex-pats. Ironically, Tasmania’s low share of the nation’s population is part of the formula that has delivered a GST distribution of $580 million over four years, which is helping the Treasurer to return the state’s finances to a $100 million surplus, three years ahead of schedule. The surplus figure is also the result of significant fiscal discipline by the state government that has held back expenditure growth to 1.1 per cent, while income has increased by 2.8 per cent. 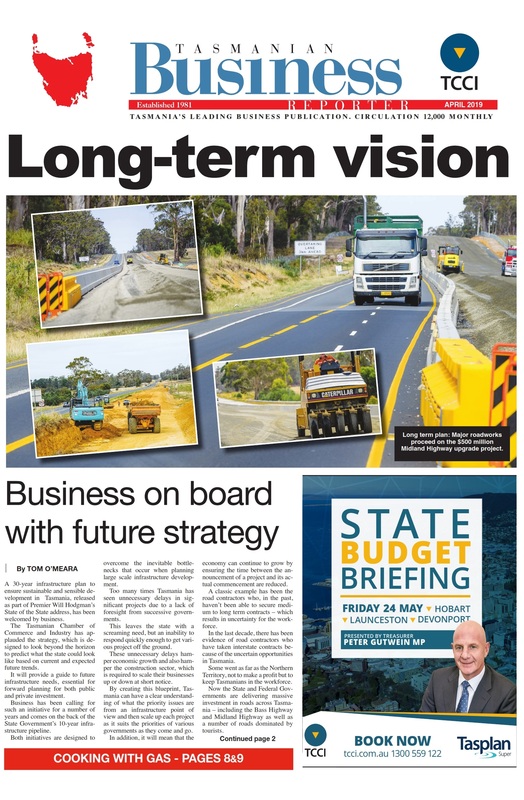 The Tasmanian Chamber of Commerce an Industry welcomed the budget saying it was a vote of confidence in Tasmanian business and would make significant inroads in stimulating the economy, particularly in the North and North West. Unsurprisingly public sector unions called for the return of some government services and the reinstatement of jobs cut in last year’s budget. The Treasurer has not changed his position, however. “We set a target of 1200 Full Time Employee (FTE) reductions over the forward estimates period and are on track to achieve the planned FTE for this year of 821 that we outlined,” Mr Gutwein said. No new taxes or increases were announced. The well-publicised job creation package will see some $315 million spent over the next four years to create some 8000 new jobs predominantly in private sector small to medium businesses. Projects include some $120 million for rails, which includes the $33 million earmarked for international shipping that was crapped as a result of changes to the Tasmanian Freight Equalisation Scheme, and a further $30 million for irrigation. A $60 million Northern Cities Major Development fund is hoped to transform Launceston, Devonport and Burnie. The Coordinator-General is working on the Devonport Living City project, the Launceston University Campus relocation as ell as an increased presence for the university in Burnie. spent on tourism over the next four years. For Forestry Tasmania, another $8 million will be invested in its operations but the Treasurer is at pains to say the funds are not for commercial operations, but for non-commercial activities such as roads, fire-fighting and access to tourism sites. On the North West Coast an additional $34.5 million will be spent on construction including a series of high school upgrades to Smithon, Latrobe, and Burnie. Domestic violence is a priority this year, with $16 million for a whole of government approach to family violence, and further indirect funding of more than $24 million across the departments of Health and Human Services and Education.